Sometimes, the more things change, the more they really do stay the same. Business cards have always served as a shorthand way to tell people what you do, and provide information for them to contact you. They still do that, easily and efficiently. But because social media has changed the way we connect with our customers, clients, colleagues and prospective employers, your card may need to be updated. When I gave my revised card to a potential client, she commented that since my Facebook business page (www.facebook.com/pachtertraining) was on the card, it would be easy for her to review the site. 1. Have I included the necessary information? Think about the majority of your potential clients and customers, and include the information they will need. Usually this means your name, your title, company name/logo, address, phone number, and email and web addresses. 2. What can I eliminate? Is the information on the card easy to read? Make sure your card is visually appealing. Can you eliminate your fax number? Do you need both your business and cell phone numbers? If you have a lot to include, use the back for the less-essential information. 4. Should I include a quick response (QR) code? These are bar codes that can be scanned by Smartphones to provide a link to your websites, LinkedIn profile, or other pertinent material. If you find using a QR code useful in your field, it usually is best placed on the back of the card. 5. Is a photograph necessary? Most corporate cards do not include photographs, but you may want to include a photograph if you use your card for marketing purposes. If you do so, make sure to use a photograph that looks like you now, and not some unrecognizable version of a younger you. Speakers will often have photographs of themselves on their cards. Information on giving out your cards can be found in my book, The Essentials of Business Etiquette: How to Greet, Eat, and Tweet Your Way to Success. 6. Will an unusual card be helpful? If you use an out-of-the ordinary card—one with an uncommon shape or design—make sure it is appropriate for your field or industry. One last thing: Always carry your cards with you. You never know when you may encounter someone to whom you want to give your updated card. 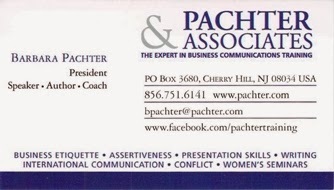 Pachter & Associates provides training and coaching on business etiquette and communication. For more information, contact Joyce Hoff at joyce@pachter.com or 856.751.6141. This is the perfect spot that accommodates all your plastic card printing requirements under one roof. The on-site plastic card printing that we offer our customers, assures that they receive a stock of quality plastic cards that have been created to look pretty exceptional through our high tech plastic card printing process. It's true that technology is advancing but business cards are still going strong. I would also say it's good more daring with card design in order to stand out. Thank you for the tips! Nice article, Its really a very informative posting indeed.Resources like the one you mentioned here will be very useful to me! Nice tips to make businesses utilize the value of social media!! Nice read out and i appreciate with you in that case. For the existence of Globalization and virtual world if you don't update of your website it must be caused for backwards of your business through online. Thanks for sharing informative article on Node.js. In recent years, this technology is going to be the future of web design and development technology. Nice to learn something from this article. By electrical contractors in chennai here. A new year is always a time of reflection, and for small business owners there are no exceptions business tips. You have raised a paramount issue..thanks for sharing..i might want to peruse more present issues from this blog..keep posting..Seo Baclinks Blog Commenting Service. So helpful tips to survive the business cards. This tips are so useful. Thanks for sharing. Thanks for sharing. Its inspirational post. Social media is no doubt a best way for business marketing. It is really helpful to reach customers directly; therefore business organizations are completely depending upon social media for best marketing purpose. I would like to collect some of the best business policy from here; thanks for such a wonderful article. Informative post.I like your blog. Thanks for sharing. Good post. I learned new information. Keep sharing. The strategy you have posted on this technology helped me to get into the next level and had lot of information in it. Social world is very important for our business organizations; as every business owners are taking good advantage from different social platforms as utilizing these as marketing tools. Social media is definitely a good marketing platform for every business in order to reach customers directly. Good post. Thanks for sharing such a useful post. Quite informative! Business cards are being replaced by websites, however, it still has its value when it comes to offline customers. Good tips though! Really an amazing post.Thanks a lot for sharing your blog. This is an awesome post.Really very informative and creative contents. Keep sharing awesome content. Thanks for sharing this unique and informative content which provided me the required information. That was an amazing post and very well presented in brief points. I would like to add how SEO can help too in getting your business some exposure. Out of the many companies present out there one should be easily able to find an affordable search engine optimization service provider to get that virtual presence. Thanks for sharing the information and keep updating us.This information is really helpful to you. I like your writing style, it was very clear to understanding the concept well; I hope you ll keep your blog as updated. Creating a website is easier than ever now, and it is relatively low cost. There are website design companies eager to have your Contentment business. The Wolf Of Online Marketing is your one stop source for honest Internet Marketing products reviews and Online Marketing news with exclusive bonuses for our readers. Thanks, for now, we share it a useful movement of valuable of Selenium Automation Tools.If you want to be learning from automation testing tools reached and visit there for below web page. It helps to keep the consistency of the networking systems. Many times the organisation faces difficulties to maintain the networking group. Only suitable technological networking systems will give those organizations the efficiency to control those difficulties. Not a single second went without leaving me in utter surprise.